Busy bustling Ladybirds are marching all around this mini cushion design, with some blue-bottle flies added for good measure. This design is a lovely reminder of the Ladybird books that many of us learnt to read with and the mini cushion looks at home nestled between these books on a shelf. Only whole cross stitch is required to stitch this design with some backstitch needed for the finer details on some of the ladybirds and for the fly wings. 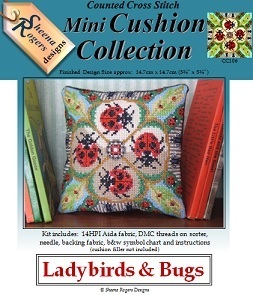 This mini cushion cross stitch kit includes: 14HPI white aida fabric, ready-sorted DMC stranded cotton threads on card sorter, needle, backing fabric, b&w symbol chart and instructions (cushion filler not included).